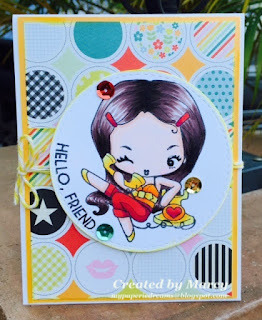 Loves Rubberstamps Blog: Hello, Friend! Happy Saturday Friends! Today, I have a fun card share for you. Hope you like it! I love the Cheeky Cherry Collection from The Greeting Farm and this is one image I don't feel I use enough! But she is really so adorable and caught my eye when I was looking for images to use for today! This is Cheeky Chat! With the life being so busy these days, I think many of us rely on technology like emails or texting. What would I do without texting every day?!!! LOL But that's why this image really makes me remember the good ol' days when I used to actually love to pick up the phone and talk for hours...especially with my BFF! :) I know I need to do more of that and this image really did make me smile! After coloring up this cutie with my copic markers, I then added Wink of Stella over parts of her outfit to give her some shimmer. The fun papers I used are called Hey Kid by Pink Paislee. I think the cheerful bright colors and cool design went well as a background for her. To finish off my card, I used an older MFT stamp set called "Ring Me" for my sentiment. I also added some sequins and twine.